ACAD-BAU is one of most effective BIM solutions available on the market. It is a German program, made by CTB Software, that runs as an application on AutoCAD® and BricsCAD® platforms. With its wide range of impressive features, compatibility and openness it pleases thousands of users mostly across Europe. ACAD-BAU represents the new generation of BIM programs using Object technology. Object is an architectural element that has a certain design features and logic to respond to various situations. For example, the wall is drawn as a 2D line element with hatch in plan view and as volumetric 3D model in axonometric view. While constructing the building it automatically adapts to all changes: automatic connection to other walls, automatic adjustment to the roof, automatic breakthroughs while inserting openings, automatic adjustment to new level parameters... All this built-in logic allows significant increase of productivity with less user interventions and therefore less possible errors, while it makes it easier to learn and work with the program. Local language: ACAD-BAU is available in German, English, Slovenian, Croatian and Macedonian language. Communication with the program in native language allows better understanding of the program, easier and faster learning and direct use of results, like descriptions and room data. Easier learning: The transition to BIM for all existing AutoCAD and AutoCAD LT users is significantly easier with ACAD-BAU. Because it is an application running on AutoCAD, users continue to work in the same program, only additional BIM tools become available. That means that users continue to set up a drawing in the same way, use basic commands (copy, mirror, array ...) in same way, view at drawing and render in same way, print in same way…Knowledge only needs to be upgraded! Since we live in and work in EU, it is important to have harmonized standards. ACAD-BAU precisely follows DIN standards, which are the foundation for an European-based project. However, it still allows full freedom defining various settings via AutoCAD styles and blocks, so that the result is aligned with your company needs. Outstanding performance: ACAD-BAU uses advanced BIM technology that enables automation of processes and therefore significantly speeds up drawing and modifying projects. At the same time, creativity is supported in easy way by preconstruction option, where you derive the form of any architectural element (window, roof, stair ...) from the simple Polyline (straight or curved). Ease of use has always been a key consideration in the developer team. - AutoCAD is still a worldwide bestseller with over 11 million users! - DWG format, used also by ACAD-BAU, is the ultimate industry standard! - The existing AutoCAD users need only to upgrade their knowledge to use ACAD-BAU . - There is a lot of personnel with good AutoCAD knowledge available on the market. - There is a lot of free material on the Internet (symbols, hatches, apps…) for AutoCAD or ACAD-BAU. ACAD-BAU creates a smart building 3D model and that is the main objective of BIM design. Focus is on the word “smart”, because such a model offers us much more than just a 3D preview of the future building. It allows us to work quick and efficient with fewer errors and the result can be used in many areas: for creating plans, presentations, analysis and inventories. Even in preliminary design it is easy to create presentations based on the 3D model and rendering features that are built into AutoCAD (quality Mental Ray render engine). It is possible to work with materials, create lightning studies (sun or artificial lighting) as well as basic walk-through animations. For advanced users, the model can be transferred into the 3ds Max for superior presentation needs. Overall associativity ensures that corrections, made on the model, are automatically applied to all floor plans, dimensions, hatches, descriptions, facades and sections, masses ... The possibility of making an error is therefore reduced and the work is done much faster. With all the built-in automation (automatic dimensioning, automatic descriptions, automatic sections and facades, automatic scale changes ...), we work much more productive! For example, outer building dimensions made exactly by DIN standard, need just two mouse clicks! At an early stage of the project we already have access to all information and data of the future building. We can check quantities, appearance of materials and colors, different structure combinations... Picture shows some of the countless structural variations of staircase and railing designs. We can simulate various impacts coming from/to the environment (like sunlight study) and optimize the design of the building – like changing the shape or orientation of the object. Limitless possibilities of quick element design with the preconstruction option, encourages creativity and allows checking of multiple design solutions. Various forms can be expanded from simple Polyline and define appearance of openings, stairs, walls, dormers ... This way of work is very fast and user friendly. There are no limitations related to built-in libraries. Drawing takes place in AutoCAD working environment, depending on AutoCAD version. This means no change for existing AutoCAD users. ACAD-BAU commands are found on Ribbon, Tool Palettes and Toolbars. ACAD-BAU offers simple and transparent setting of levels. Each level can have any number of Split levels or Height definitions. Depending on the height of the selected level, all building elements are properly inserted at the right vertical position. All level changes are automatically applied to the model. Walls are defined in a library, that can be easily expanded with own wall combinations. Each wall can have up to 10 layers and each layer can have a free form. The walls can be stacked one over another and wall chases and corner bonds can be inserted into them. Wall can be drawn directly or derived from preconstruction, when it comes to complex curves. Wall, adjusted to the roof, automatically responds to any changes in the position, shape or inclination of the roof. Framework construction allows a wide range of division variations on the facade. Different fills can be inserted among pillars and posts, such as glass, windows, doors, composite elements or openings. A variety of parametric details are available to plot the structure and its coverings. In addition to Framework walls, also Framework roofs can be used. Three types of openings are available in ACAD-BAU: classic windows, corner windows and doors. Classic windows can have a shape parametrically defined from basic shape library, or can derive the shape from any closed polyline. Openings are smart objects and automatically respond to any change of the wall. Position of the openings can be modified with AutoCAD commands (including grips) and each new opening automatically breaks the wall and terminates the hatch. Stairs are one of the most complex ACAD-BAU objects. Setting up the stairs is easy because of the dynamic preview, that reflects each parameter change. There are plenty of construction variations available for steps and railings. Form can be edited with grips and landings can be added at any time. Complete freedom of form is available by Preconstruction stairs, where 3 Polylines determine stair edges and walking line. Detailed construction plan for stairs with all dimensions can be made automatically. All hatching is done automatically while drawing and also adjusts automatically to any change, such as different scale or window into wall insertion...). Each wall layer has own hatch (depending on the material), which can be replaced at any time. Transparent solid hatches can be used for room analysis – like housing units or spatial use. The program offers also some specific hatching, like isolation or diagonal cross for wooden profiles. Outer building dimensions by DIN standard can be done fully automatic way. 4 dimension lines are made on each side of the building with 2 clicks. At any geometry or scale change, all dimensions are automatically updated. Visual appearance of dimensions is defined by AutoCAD dimension style and can therefore satisfy any special need. Dimensions can be edited in many ways without loss of associativity. Extensive libraries of 2D and 3D symbols are already included. All symbols are made as dynamic blocks and are arranged on Tool Pallets for easy access. 3D symbols already have materials assigned and can be used for high-quality visualizations without any further editing. Interior 3D libraries have an option to change their color/material combinations via one click. ACAD-BAU is capable of producing an inventory of rooms, quantities and volumes or surfaces of the building. Calculations are following DIN standards, allowing additional fine tuning. Quantity take-off produces a table of different data about objects of interest. Export to Excel is possible for further processing. According to the inventory also positions of elements can be marked in the plan. Rooms can be combined in housing units and distinguished by spatial use. Roofs can be made automatically on any floor plan or can be derived from a combination of simple roofs, that intersect by default. Each roof can have a desired number of layers and ending details. Dynamic changes with grips are possible for modifying inclinations, eaves and positions. Walls and other structures are following each change in the roof. Different objects like roof windows, skylights or dormers can be inserted. Dormer automatically breaks the main roof and includes roof, window and walls in one object. Floor plans, details, facades, sections, axonometric and perspective views ... are obtained automatically from the 3D model. Sections are defined by the section line on any plane and result has proper hatching applied. Result can be shown in different scale with different settings – also in a form of freehand sketch. All views are automatically updated with every change in the model. By changing the scale of the drawing all elements update automatically: text is resized as well as the density of hatches. Besides that, also Level of detail can be changed, influencing the degree of detail drawn for each architectural element. All control is given to the user to define what and how is visible in a certain Level of detail. As the working environment is AutoCAD + ACAD-BAU, options are practically limitless. ACAD-BAU cares about quick and accurate work in the Architectural field and AutoCAD provides all other 2D drafting and 3D modeling capabilities, to solve any possible scenario. There is no problem to start planning an interior furniture design or whole urbanism. AutoCAD also allows upgrading to over 4000 independent specialized applications for other areas. ACAD-BAU 16 is the latest software edition. It offers various new very useful features. One of them is a great improvement even for AutoCAD users only. The new ACAD-BAU upgrade has once again proven that new feature improvements follow the needs and wishes of its users and more. ACAD-BAU 16 definitely reinforces its place among top BIM software! ACAD-BAU was already able to reduce construction geometry in Top (plan) view; however AutoCAD solid 3D models showed all hidden lines and looked quite messy. A new tool converts top view of such 3D model into a clean floor plan view with purged hidden lines. Prefabricated constructions offer new options to achieve plenty of non-standard constructions and possibilities to build with more than just basic building elements. Constructions like pillars, beamers and other offer more options independent of material. 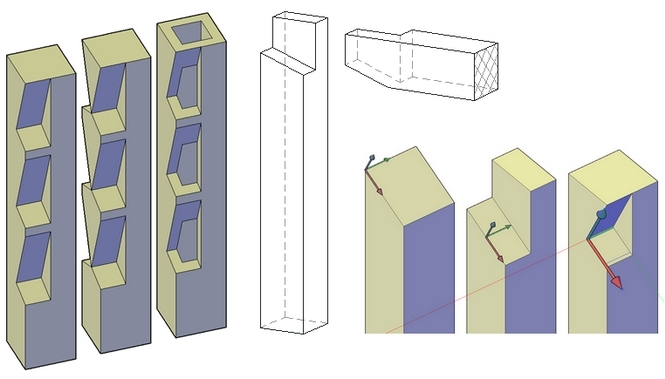 - Fixed profile shapes can be unfixed and simply changed using AutoCAD grips and Boolean operations (Subtract, Union, and Intersection). - Construction created from Polyline based path can be easily edited using AutoCAD grips. Many AutoCAD users would find this new tool very useful. Drawing without Snap, inaccurate coordinates, minimal shifts in horizontal or vertical lines, objects lost on various elevations, geometry edge gaps, unused geometry lost in AutoCAD space… All listed and more hinders fluent and accurate work in AutoCAD, causing errors and command malfunctions. A new ACAD-BAU tool can fix these anomalies automatically. - Option to select entire wall together with all sub-elements (windows, doors, pillars…).